28-day Challenge Who Knows What Day I’m On! Oy! I’ve been a very bad blogger the last few (actually more like seven) days—not writing, indulging way to much, and working out way too little. The good news is that it’s Monday, and everyone always has a chance to redeem themselves on a Monday—start the week off on the right foot and get that momentum back! I’m not sure how I let myself get off track on the 28-day Challenge. One bad eating day turned into two, and two turned into four, and well you know how it goes. But, we’re not going to dwell on that. The fact is I don’t want to give up. I don’t look at it as starting over, I just look at it as continuing the process. I’m always going to have some good days and bad days, but we get over it and we move on! “Me time” scheduled – check. The next four weeks are going to be very hectic for me. I’m covering for a co-worker who is on vacation for the next month plus I have school. I think it’s important that I schedule my life for the four weeks so I can stay on top of everything, including my eating and my workouts. You’ll see I scheduled some “me time” in there as well so I don’t go crazy and burn myself out, which I sometimes have a tendency to so. I know what I’m like when I’m super busy so I’m taking steps ahead of time to mitigate any stressful disasters. 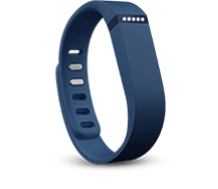 The Fitbit Flex tracks how many steps I take, calories I burn, and distance I go. If I wear it to bed it will even monitor my sleep and wake me in the morning with a light vibration on my wrist. You can set goals and it will tell you how close you are to reaching your goal for the day keeping you motivated to keep going. It syncs up with an app on my iPad and my laptop (wirelessly!) so I can check on my progress anytime. I’m really excited to get started with my Fitbit and I have it all charged up for Monday. A full charge lasts for five days so I can wear it day or night without worry that it’s going to run out of power. I’ll use it for a little while and then post a full review on the blog in a few weeks. So there is my long overdue update! I didn’t lose any weight last week (in fact I gained a pound 😦 ) but hey, I’ll just have to work harder this week. I’m still further ahead then I was when I started! I’m glad I’m not the only one who’s having trouble with posting often. Sometimes life gets pretty overwhelming, but as long as we are still going in the right direction, we’ll succeed.